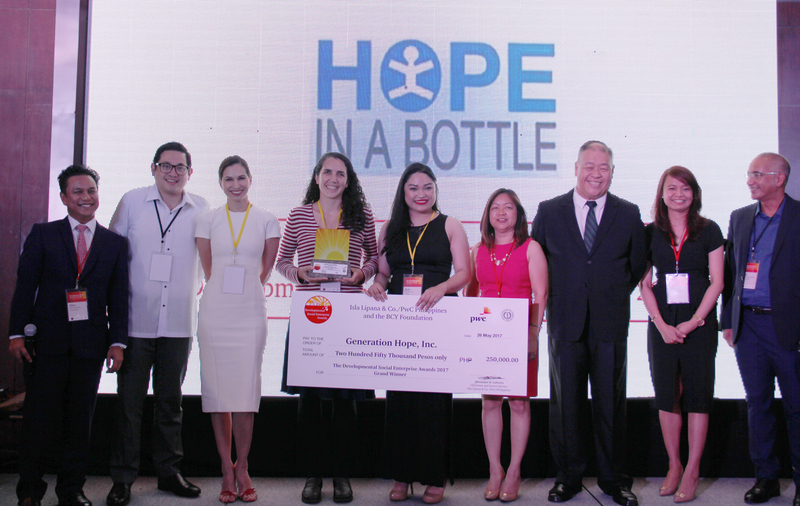 GenerationHope, Inc., the social enterprise behind “Hope in a Bottle” purified bottled water, is the Grand Winner of this year’s Developmental Social Enterprise Awards (DSE Awards) presented by Isla Lipana & Co., the Philippine member firm of the PwC global network (PwC Philippines), and CSR thought leader Benita & Catalino Yap Foundation (BCY Foundation). Other finalists were BEAGiver Ventures, Inc., designer, maker and seller of good quality backpacks for the benefit of poor schoolchildren; Bote Central, innovative coffee roasting machine maker and advocate of converting instant-coffee drinkers to freshly roasted brewed coffee; CITIHUB dormitory for workers living outside the metro in need of livable transient space; and OrganicOptions, an organic marketing company that bridges the gap between farming communities and consumers. These Filipino enterprises committed to social objectives through its enterprise activities were recognized during the DSE Awards Night held 26 May 2017 at The City Club, Alphaland Makati Place in Makati City. GenerationHope, Inc., founded by its Chairperson and President Nanette Medved-Po, helps solve the country’s shortage in classrooms by giving 100 percent of its profit to fund the construction of school buildings. “Helping social enterprises by offering them support and guidance through our skills, experience and mentoring is PwC Philippines’ way of supporting sustainable economic growth. This is our fulfillment of PwC’s purpose – to build trust in society and solve important problems,” said Alex Cabrera, Chairman and Senior Partner of PwC Philippines. A screening committee, composed of nine judges from various sectors such as the academe, social enterprise sector, government, and private businesses, selected the finalists and top winner. Senator Paolo Benigno “Bam” Aquino IV headed the panel of judges.